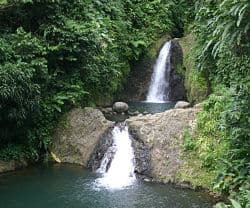 If you are looking to experience the beauty and nature of Grenada, then one of the hikes that you really must experience is that to the Seven Sisters Waterfalls. Located close to the Grand Etang Lake, the Seven Sisters Waterfalls really are made up of seven waterfalls and are worth a look. The water is crystal clear and fresh enough to be tasted. Take your swim suit and suitable shoes as the track can be a bit slippery if it has recently rained. To take the hike, take the road heading to the interior from Grenville and follow the road for 3 or 4 miles until you see the sign on the left saying ‘Margaret Falls’. If you reach the Grand Etang Lake then you have gone too far. Along this road from Grenville you’ll see pretty views of mountains and rivers and many photo opportunities. Once you make the turn, there’s a car park at the top of the hill. You’ll want to look out for a guide to take you on the 30 minute walk down to the falls. On the day that we went the guide was already employed elsewhere, but we passed him and he was very helpful and suggested that we walk with a stick in order to make it easier to navigate the deep set steps. If you do hire a guide, you might want to ask him whether he will take you to the lesser known Honeymoon Falls which is in close vicinity but often missed by visitors to the Seven Sisters. The walk down is very manageable if you are at all active but it does have a lot of steps. You’ll walk through rainforest vegetation and pass large bamboo plants and other tropical flora including beautiful heliconia flowers. After 20 or 30 minutes heading down the steps, you’ll also need to cross some rocks. You’ll then reach the two first falls. The pools are deep enough to swim and cool off in. 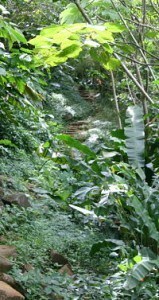 If you want to walk further take the path up the right hand side for 30 minutes or so to find the next set of falls. When it’s time to return to the car, then you’ll find that it’s easier going back up the steps than it was going down.